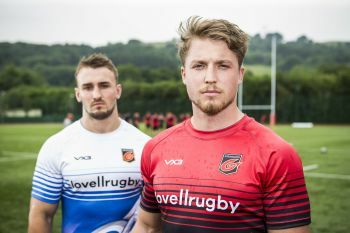 Dragons started their pre-season campaign with a convincing 31-17 victory away to English Championship side Ealing Trailfinders. New boys Ryan Bevington, Rhodri Williams and Brandon Nansen all scored tries while Joe Goodchild and Brok Harris also crossed for scores either side of half time. Josh Lewis and Gavin Henson kicked the rest of the points. Wales under 20 Goodchild got the scoreboard moving early on following impressive work by full-back Jordan Williams and centre and captain Jack Dixon down the short side in the build-up. Much of the rest of the first half was a bit of an arm wrestle, until new signing Rhodri Williams came up with a moment of magic. Picking the ball up inside the Ealing 22, the scrum-half made it all the way to the line for a sensational try which Fly half Josh Lewis improved to make it 12-0. Bevington then made it three for the day by running a good support line to Josh Lewis' break and another conversion from Lewis helped put the Dragons in total control approaching half time. Ealing made a game of it before the break, with Lewis Jones crossing in the corner just before Wayne Barnes' half time whistle and Craig Willis touched down when the game resumed to further narrow the gap. As the second period continued the Dragons emptied their replacements bench as all 26 players got a run out, with the changes first bringing immediate returns with further tries from Brok Harris and debutant Brandon Nansen, with Henson taking over the kicking duties. Former Dragon Will Harries completed the scoring in the final few minutes as Ealing had the last laugh, but there was no doubting who deserved to win.